By 1891 the family were living in Wildnerness Cottages, Hough. George had been a farm worker but was now an ironstone miner. In 1895 George and Sarah Anne took Eliza Footitt to court, charging her with stealing a baby’s jacket from a pram in Hough. By 1900 George seems to have died and Sarah Anne had moved to The Row, Gelston. She was still there in 1911, but seems to have died in 1919, possibly whilst living with Arthur in Derbyshire. William was a farm labourer in Hough (age 15) in 1891. He later moved to Hull and by 1919 he was living at 46 Field St, off Holderness Rd. Eliza marred George Baggeley in Lincoln in 1903. By 1911 they were living in City Court, Saltergate, where George was labouring in a foundry. In 1891 John (age 12) was a farm labourer in Hough. He later moved to Lincoln where he married Mabel Mathers in 1910. In 1911 they were living at 3 Harrods Cottages, Cross St, Lincoln and he was working as a labourer. By 1915 they’d moved to 23 Clifton St, Lincoln. Harry was a mate on a canal boat at Fosdyke, Torksey in 1901. He later moved to Hull and in 1919 he was living at William’s house in Field St.
Charlotte was in Gelston in 1900 but in 1901 (aged 18) she was working at the Old Crown Inn in Clasketgate, Lincoln. On Christmas Day 1902 she married Walter Robinson in Lincoln. By 1915 they were living at 3a Upper Saxon St. In 1891 Arthur (age 16) was boarding at Carlton Ashes (with Frederick Bon), where he was working as teamster . By 1911 he was lodging in Stanton by Dale, Derbyshire and working as a pipemaker at Stanton Ironworks. He married Mary Ann Chattings in 1911. Theresa (aged 14) was a servant in Dry Doddington in 1901, working for M. Collin (born Gelston). In 1911 she was in Lincoln, employed as a ‘lady’s companion’ by Mrs Lucy Parkinson. In 1913 Theresa married Walter Fox in Lincoln. He was from Saxilby and had started as a baker before joining the Army (Royal Garrison Artillery) aged 18 in 1904. After training and a year in Hong Kong he left the Army in 1907 and moved back to Saxilby where he became a machinist. In Aug 1914 he was called up from the reserve and served in France for 14 months. He came back to England in Oct 1915 and was discharged in Jan 1917. They moved to Newark where Walter worked for Ransom and Co. Theresa died in Newark in 1975. In 1900 Ernest was at home in Gelston. One evening in July he was sent on an errand that ended up with a court case – Sophia Henson sent Ernest to fetch the milking cows, 2 heifers and a steer. On the way back one of the heifers was apparently seen eating yew branches that had been cut from a hedge outside Joseph Toulson’s farm. The next day the heifer died from yew poisoning. Neither party knew that yew was so poisonous and Toulson counter-claimed against Miss Henson for the heifer damaging his fence. Ernest’s sister Charlotte Haywood gave evidence that the heiffer did not stop to eat outside Toulson’ farm. In 1911 Ernest was working as a cowman on the Gilbertson’s farm in Claypole. By 1919 he was Lincoln. In 1911 Cecil (18) was living with his mother in Gelston and working on a farm. By 1915 he was a labourer in Stanton by Dale, probably at the ironworks. In Apr 1915 he volunteered for the Lincolnshire Regiment in Ilkeston (near Stanton). After training with 3rd Battalion in Grimsby (and being fitted with dentures) he joined 2nd Battalion in France on 30th Sep 1915. The following month he was promoted L/Cpl. On the morning of 1st July 1916, the opening day of the Somme Campaign, 2nd Lincolnshires were opposite the village of Ovillers. At 0730 the battalion climbed out the trenches to attack the village. But there had only been a short mortar barrage in preparation and the advancing infantry were hit hard by the German counter barrage. Of the 8000 men in the Division, well over half were casualties, including almost 2000 killed. Cecil Haywood was amongst those who disappeared that morning. His body was identified at the end of the war and moved to Serre Road Cemetery, near Albert. 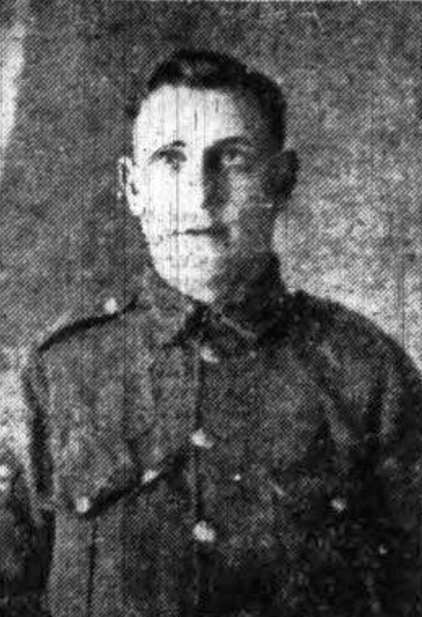 His name (spelt Hayward) is on the Hough on the Hill war memorial. Claude was the youngest of the Haywood children. In 1911 he was living in Gelston with his mother and brother Cecil and working as a farm waggoner. He apparently lived in Lincoln for a while but by 1913 he’d moved to Stanton by Dale and was a foundry labourer at Stanton Ironworks. In Jan 1913 he joined 1st Battalion, Lincolnshire Regimennt, signing up in Lincoln for 7 years ‘with the colours’ plus 5 years in the reserve. He trained in chiropody and then in transport duties. In Mar 1914 he was promoted to L/Cpl. A week after war was declared his battalion was sent to France with the BEF and they were soon in action at Mons. During the Battle of the Marne in Sep 1914 they were the first British unit to capture German artillery. Claude’s part in this action earned him another stripe and he became an acting Corporal on 1st Oct.
On 20th November he was promoted again, to acting Sergeant, but 4 days later he was admitted to a field ambulance with frostbite. By 26th Nov he was in hospital in Boulogne. A week later he was back in England and admitted to Providence Hospital, St Helens. He returned to France on 16th Feb 1915 and the following month he spent his 21st birthday in the trenches. On 3/4th June the battalion attacked a chateau near Bellewaarde / Hooge, east of Ypres. Claude was initally reported as missing but was later assumed to have been killed on 4th June, as were several other Lincolnshire men. His body was found later in the war, identified from his identity disc, and re-buried in Bedford House Cemetery. In Sep 1918 his brother William was sent the disc, his watch and a photograph. Claude’s name (spelt Hayward) is on the Hough on the Hill war memorial.